CBI - China: Day 82 of 154 of the Japanese Invasion of Manchuria. Spain: Day 145 of 985 of the Spanish Civil War. Spain: Day 510 of 985 of the Spanish Civil War. CBI - China: Day 155 of 2,987 of the 2nd Sino-Japanese War. 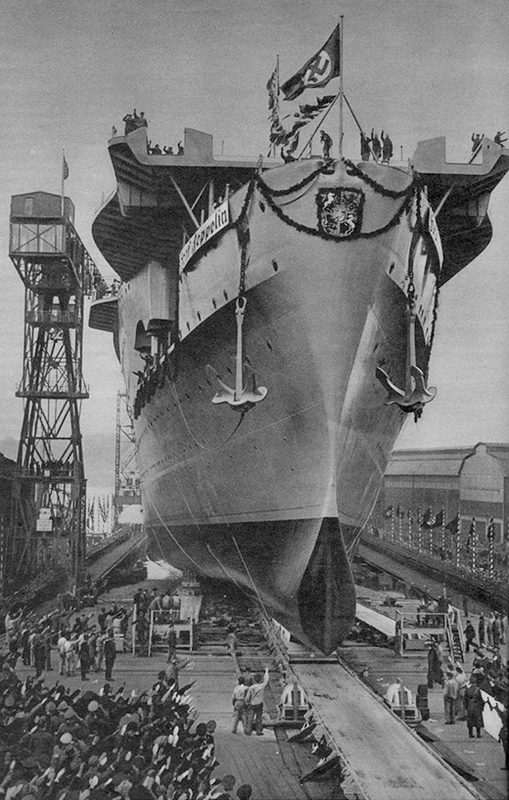 Germany: The Kriegsmarine's only aircraft carrier GRAF ZEPPELIN is launched, though far from complete. She will not be completed, nor become operational, and will remain in the Baltic for the duration of the war. The Graf Zeppelin represented part of the Kriegsmarine's attempt to create a well-balanced oceangoing fleet, capable of projecting German naval power far beyond the narrow confines of the Baltic and North Seas. Due to shifting construction priorities necessitated by the war, the Graf Zeppelin was never completed and never became operational. By the outbreak of war on 01 Sep 39, she was 85% completed, but that was it. Hitler, it seems, never fully grasped the importance of a strong navy with a full fleet of aircraft carriers. Although the Kriegsmarine's U-boat fleet wreaked havoc throughout the Atlantic for several years, it just wasn't enough. 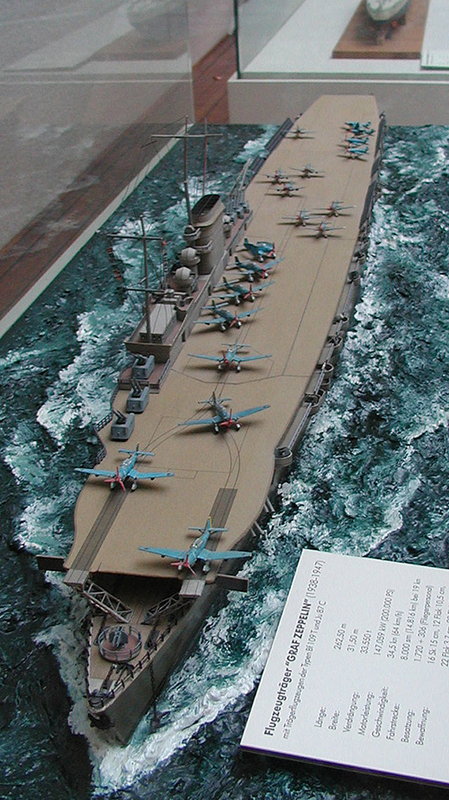 The carrier would have had a complement of 42 fighters and dive bombers. On 05 Dec 42, Graf Zeppelin was towed back to Kiel and placed in a floating drydock. It seemed she might well see completion after all, but by late January 1943 Hitler had become so disenchanted with the Kriegsmarine, especially with what he perceived as the poor performance of its surface fleet, that he ordered all of its larger ships taken out of service and scrapped. In April 1943 Graf Zeppelin was again towed eastward, first to Gotenhafen, then to the roadstead at Swinemunde and finally berthed at a back-water wharf in the Parnitz River, two miles from Stettin, where she had been briefly docked in 1941. There she languished for the next two years with only a 40-man custodial crew in attendance. When Red Army forces neared the city in April 1945, the ship's Kingston valves were opened, flooding her lower spaces and settling her firmly into the mud in shallow water. A ten-man engineering squad then rigged the vessel's interior with demolition and depth charges in order to hole the hull and destroy vital machinery. On 25 Apr 45, just as the Soviets entered Stettin, the squad detonated the explosives, rendering the ship useless to her new owners for many months to come. The Soviet Union raised the ship in March of 1946, and she was ultimately sunk in weapons tests north of Poland. Spain: Day 875 of 985 of the Spanish Civil War. CBI - China: Day 520 of 2,987 of the 2nd Sino-Japanese War. Day 58 of 81 of Japan's Operation GUANGDONG. Atlantic: Two more U-boats are reported to have been destroyed as the British campaign to destroy three of them a week continues. Finland: Day 9 of 105 of the Russo-Finnish War. CBI - China: Day 885 of 2,987 of the 2nd Sino-Japanese War. Day 24 of 381 of the Battle of South Guangxi. ETO - UK: Day 94 of 258 of the Blitz. ETO - Spain: Franco tells Hitler that Spain is not prepared to enter the war. MTO - Albania: Greek forces take Argyrokastro and Delvino. East Africa: Day 182 of 537 of Italy's East African campaign in the lands south of Egypt. CBI - China: Day 1,251 of 2,987 of the 2nd Sino-Japanese War. CBI - Thailand: Day 69 of 221 of the Franco-Thai War (Vichy France vs Thailand). 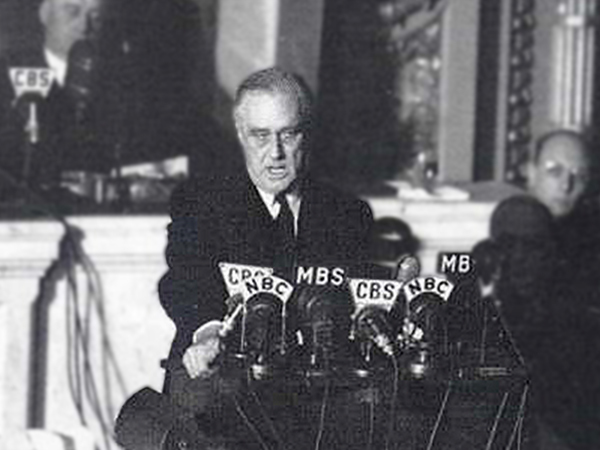 USA: After an 82-0 vote in the US Senate and a vote of 388-1 in the House of Representatives, President Roosevelt signs the declaration of war against the Empire of Japan. "Yesterday, December 7, 1941 - a date which will live in infamy - the United States of America was suddenly and deliberately attacked by naval and air forces of the Empire of Japan. No matter how long it may take us to overcome this premeditated invasion, the American people in their righteous might will win through to absolute victory." FDR's 10-minute speech, ending with an oath - "So help us God" - was greeted in the House by thunderous applause and stamping of feet. Civilian defense groups were immediately mobilized on both coasts. In New York City, Mayor LaGuardia ordered the rounding up of Japanese nationals, who were transported to Ellis Island and held in custody indefinitely. In California, antiaircraft batteries were set up on Long Beach and the Hollywood Hills. Reports on supposed spy activity on the part of Japanese Americans began pouring into Washington, even as Japanese Americans paid for space in newspapers to declare unreservedly their loyalty to the United States. UK: Britain and its Commonwealth Nations declare war on Japan. The Soviets do not. Germany: In occupied Poland, near Lodz, Chelmno extermination camp becomes operational. The first gassing victims include 5,000 Gypsies who had been deported from the Reich to Lodz. Russian Front - North: Day 92 of 872 of the Siege of Leningrad. Russian Front - Center: Day 68 of 98 of the Battle of Moscow. The Soviet offensive against German Army Group Centre succeeds in breaking through the lines in many places, causing hasty withdrawals. Russian Front - South: Day 40 of 248 of the Siege of Sevastopol, Crimean Peninsula. MTO - Libya: Day 243 of 256 of the Siege of Tobruk. The British 8th Army officially relieves their Tobruk garrison. CBI - China: Day 1,616 of 2,987 of the 2nd Sino-Japanese War. Day 1 of 18 of the Battle of Hong Kong. The Japanese begin their attack on this British port. The Japanese overrun the US garrisons stationed in Shanghai and Tientsin. CBI - Malaya: Day 1 of 55 of the Battle of British Malaya. The RAF manages to damage three Japanese transport ships headed toward Malaya. CBI - Thailand: As the Japanese entered Thailand, the Thai government quickly agrees to become a puppet state. PTO - Marshall Islands: Day 1 of 17 of the Battle of Wake Island, which will become known as the Alamo of the Pacific. PTO - Mariana Islands: Day 1 of 3 of the 1st Battle of Guam. Four hours after the attack on Pearl Harbor began, the Japanese launch their attack on America's strategic, yet woefully under-defended island territory of Guam. The attacks of the 1st Battle of Guam began just four hours after the attack on Pearl Harbor, but since Guam lies west of Hawaii across the International Dateline, the date goes on record as beginning on December 8th. 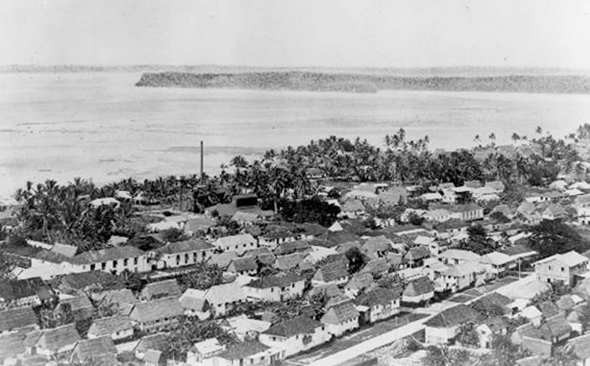 The US government did not think it would be practical or possible to defend Guam if the Japanese attacked it, having put very little into the island since 1898 when it was ceded from Spain to the US. At 8:27 am local time, several Japanese aircraft based on Saipan attacked the Marine Barracks on the Orote Peninsula, the Piti Navy Yard, the Libugon radio station, the Standard Oil Company and the Pan American Hotel. The minesweeper USS PENGUIN, the largest navy vessel at the island was attacked and, when disabled, scuttled and sunk by the crew. One officer was killed and several men wounded. The air raids all over Guam continued into the morning and afternoon before subsiding at 5:00 pm. Less than 48 hours later, the Japanese landed an overwhelming force of 5,500 naval infantry on the island and quickly overwhelmed the small American and native forces who attempted to defend the capital city of Hagatna. The US Naval governor was forced to appear on the parade field in Hagatna without trousers to sign the surrender. He, his staff and the surviving Marines were placed on ships to serve out the war as the first and longest held American prisoners of war of the Japanese. PTO - Philippines: Day 1 of 152 of the 1st Battle of the Philippines. Japanese begin assaulting the US positions. USA: Production of artificial rubber is given top priority above other war production programs. ETO: US 8th Air Force: A study of air attacks on submarine pens indicates that US bombs are incapable of penetrating the roofs of the pens from any bombing level. Russian Front - North: Day 457 of 872 of the Siege of Leningrad. Russian Front - North: Day 20 of 59 of the Battle of Velikiye Luki, near Leningrad. This stalemate does help ease the siege a little, but mostly it keeps German troops from being sent to other fronts. Russian Front - North: Day 218 of 658 of the Siege of the Kholm Pocket, USSR lays siege to the Kholm Pocket but the Germans hold out for a about a year and a half. Russian Front - Center: Day 15 of 21 of the Battle of Sychevka, Russia. Russian Front - Center: Day 14 of 26 of the 2nd Battle of Rzhev-Sychevka, Russia, launched by the Soviets as Operation MARS. Russian Front - Center: Day 14 of 22 of the Battle of Belyi, Russia. Russian Front - Center: Day 14 of 17 of the Battle of Luchesa (Vitebsk), Russia. Russian Front - Center: Day 14 of 29 of the Battle of Molodoi Tud River, Russia. Russian Front - South: Day 109 of 165 of the Battle of Stalingrad, bloodiest battle in human history. MTO - Tunisia: Day 22 of 178 of the Battle of Tunisia. German troops occupy the port of Bizerte. British 1st Army receives permission to withdraw from areas west of Tebourba and east of Medjez el Bab to more favorable positions from which to attack Tunis. US 12th Air Force provides Allied air support. MTO - Libya: US 9th Air Force P-40s fly fighter-bomber missions in the battle area east of El Agheila. CBI - China: Day 1,981 of 2,987 of the 2nd Sino-Japanese War. PTO - Alaska: Day 185 of 435 of the Battle of Kiska, Aleutian Islands. PTO - Malaya: Day 293 of 357 of the Battle of Timor Island, a long guerrilla war ending in Japanese victory. PTO - New Guinea: Day 20 of 66 of the Battle of Buna-Gona. PTO - Solomon Islands: Day 124 of 187 of the Battle of Guadalcanal. Eight US PT boats turn back 8 Japanese destroyers attempting to reinforce Guadalcanal. 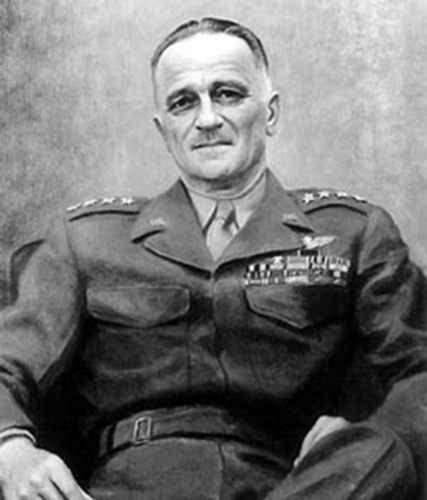 ETO: Lieutenant General Carl Spaatz becomes the chief of US strategic Air Forces in Europe. As commander of Strategic Air Forces, Spaatz (pronounced Spots) directed the US portion of the strategic bombing campaign against Germany, directing the Eighth Air Force, which was commanded by Lieutenant General Jimmy Doolittle, based in England, and the Fifteenth Air Force, which was commanded by Lieutenant General Nathan Twining, based in Italy. Spaatz was under the direct command of General Dwight Eisenhower. In March 1944, Spaatz proposed the "Oil Plan" for bombing, and in June 1944 during the Operation CROSSBOW priority bombing of V-1 sites aimed at the UK, Spaatz advocated, and received authorization from Eisenhower for, bombing of those targets at a lower priority. After the war, Eisenhower said that Spaatz, along with General Omar Bradley, was one of the two American general officers who had contributed the most to the victory in Europe. After VE day he was transferred to the Pacific and assumed command of the US Strategic Air Forces in the Pacific as part of the Pacific Theatre of Operations, with headquarters in Guam. From this command, Spaatz directed the strategic bombing of Japan, including the atomic bombing of Hiroshima and Nagasaki. Spaatz had been present at Reims when the Germans surrendered to the Americans on May 7, 1945; at Berlin when they surrendered to the Russians on May 9; and aboard the battleship MISSOURI in Tokyo Bay when the Japanese surrendered on September 2. He was the only man of General rank or equivalent present at all three of these acts of surrender. Russian Front - North: Day 822 of 872 of the Siege of Leningrad. Russian Front - North: Day 583 of 658 of the Siege of the Kholm Pocket. USSR lays siege to the Kholm Pocket but the Germans hold out for a about a year and a half. Russian Front - South: Day 107 of 122 of the Battle of the Lower Dnieper River, USSR. MTO - Greece: US 15th Air Force B-24s and B-17s attack Tatoi and Eleusis airfields. MTO - Italy: RAF and US Air Forces provide air support. CBI - China: Day 2,346 of 2,987 of the 2nd Sino-Japanese War. Day 37 of 49 of the Battle of West Changde. PTO - New Guinea: Day 81 of 219 of the Battle of Shaggy Ridge. PTO - New Guinea: Day 78 of 162 of the Battle of the Huon Peninsula. Australian troops capture Wareo. PTO - Solomon Islands: Day 38 of 295 of the Battle of the Bougainville Islands. ETO - France: Day 130 of 284 of the Battle of Brittany. ETO - France: Day 85 of 236 of the Siege of Dunkirk. ETO - Germany: Day 81 of 145 of the Battle of Hürtgen Forest. ETO - Germany: German troops evacuate Julich on the Roer river. Russian Front - Finland: Day 85 of 223 of the Lapland War. Finland and Russia have joined forces to kick the Germans out of Finland's most northern province. Russian Front - Center: Day 55 of 206 of the Battle of the Courland Pocket in Latvia. Russian Front - Center: Day 48 of 99 of the Siege of Memel, a border town of Lithuania and East Prussia. Russian Front - South: Day 41 of 108 of the Battle of Budapest, Hungary. The Soviet Army begins an offensive aimed at encircling Budapest. MTO - Austria: US 15th Air Force B-17s and B-24s bomb targets at Moosbierbau, Graz, Klagenfurt, and Villach. CBI - Burma: Day 252 of 302 of the Chinese Salween Offensive. CBI - Burma: Day 25 of 31 of the Battle of Bhamo. CBI - China: Day 2,712 of 2,987 of the 2nd Sino-Japanese War. Day 236 of 259 of Japan's Operation ICHI-GO. PTO - Japan: The USAAF begins a 72-day bombardment of Iwo Jima Island located 700 miles to the south of Japan. PTO - New Guinea: Day 347 of 597 of the Battle of New Britain. PTO - New Guinea: Day 231 of 481 of the Battle of Western New Guinea. PTO - Philippines: Day 50 of 299 of the 2nd Battle of the Philippines, aka the Liberation of the Philippines or the Philippines Campaign. PTO - Philippines: Day 50 of 73 of the Battle of Leyte. The Japanese launch a second airborne counter-attack on US airfields at Leyte. PTO - Philippines: Day 28 of 41 of the Naval Battle of Ormoc Bay. Germany's preoccupation with war in the east drained away the necessary resources to complete their aircraft carriers.